During Argentina's "dirty war" in the 1970's, the state imprisoned dissidents and other undesirables, including many artists. For some, their treatment was extreme. They were kept in solitary confinement. Their only chance to interact with other human beings was an hour each Sunday. The prisoners were allowed to sit four to a table. As long as they sat and kept their hands on the table, they were allowed to talk; if they stood up, they could be shot. With this treatment the regime hoped to break their spirits...but amazingly, on their Sunday meetings, they made theatre. Two prisoners would serve as audience and two would perform. Tapping into the oldest of instincts, they created stories that transcended the prison walls and allowed them to dream, to explore, to be human. This is the remarkable story we learn in the pre-show speech for 24th Street's production of La Razón Blindada (or "Armored Reason"). Written by Argentine Aristides Vargas the play itself was inspired by interviews with political prisoners, one of them his brother. The resulting script shifts between three realities: startling words from the dissidents themselves, a chair-bound performance of Don Quixote and Sancho Panza from Cervantes, and the words of Kafka. The staging is beautifully simple and elemental. Two actors, two chairs and a couple of tables. We meet two inmates, one called De La Mancha and the other Panza. In between nervous looks and desperate admissions of how dire their circumstances are, they perform Don Quixote. The whole time they are trapped in their chairs -- remember if they stand they are shot. So in one moment you have Quixote questioning Panza if his brains are melting and then in a jarring and sudden transition the two sit bolt upright, hands on the table, with a quick "cuidado!" (careful!) as they watch for a passing guard. Then in the next moment Panza is playing a dog and railing against the injustices suffered by man's best friend -- in between scratching his ears. What makes the piece work is the remarkable commitment, physically and emotionally, of the two actors. The play is a delicate balancing act between the brutal repression of the prisoners' reality and the total abandon and joy of the moments of storytelling. And these two actors embody this juxtaposition beautifully. La Razón Blindada is performed in Spanish with English subtitles. A couple of tips: one, if you don't speak Spanish, sit towards the back of theater so you don't have to shift your gaze to read and catch the action. Two, in fact don't worry too much about the subtitles. It doesn't take a fluent Spanish speaker to tell that the subtitles are less than a literal translation. Get the basics from the text and then enjoy the performances. You'll get more from the words than you might think. 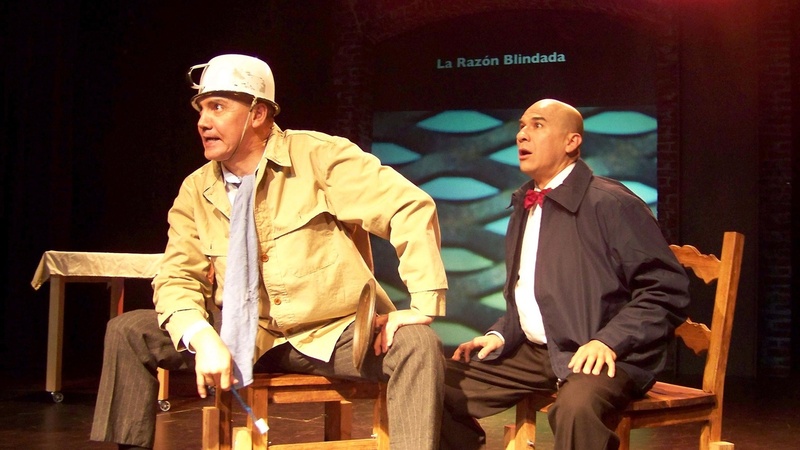 La Razón Blindada plays Saturdays through April 30 at the 24th Street Theatre in downtown Los Angeles.